Brighton-based four-piece indie rockers Black Honey graced the Norwich Arts Centre, supported by the contemporaries PINS and Russo, as part of their expansive UK autumn tour. For a band that has not visited Norwich often, as lead singer Izzy B. Phillips remarked in her set, the venue was impressively packed. The vibe floating through the converted church was a pleasant far cry from the ‘middle of the working week’ slot that such a set time might have merited. Perhaps this popularity was owed to Black Honey’s recent appearance at Norwich’s Sound + Vision Festival, or because the recent release of the bands self-titled debut album had sparked a wave of interest. As supports Russo took to the stage, the catchy tunes began to infect the crowd. Clearly influenced by artists such as Metronomy, Russo had a playful allure to their songs. I would highly recommend their song Bad Things to anyone interested in a distinguished, fresh and vocals-driven sound. Stepping up the intensity second were PINS, the Manchester rock 5-piece bringing a heavier element to the room, amping up the eager crowd for the main act. 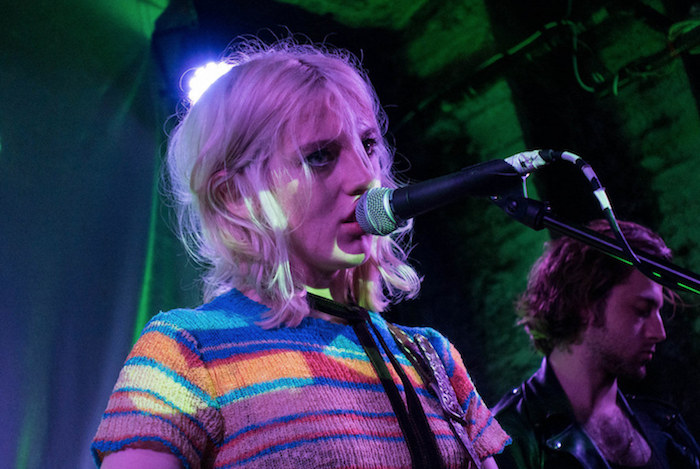 As Black Honey’s set began, their reasoning for their choice of these warm-up acts soon became obvious; the sound of their new album clearly utilises similar elements to these indie rock staples. From the beginning of their set with I Only Hurt The Ones I Love to the middle with songs like Corrine, Phillips’ vocals were a clear, crisp highlight, falling in and out of harmony with her bands instrumental in all the right places. In other moments, such as on Midnight, the band let the synth take over, creating gloriously driving waves of noise. This was a well-honed sound and a setlist clearly designed to show off the band’s latest work. Overall, Black Honey’s set consisted of an hour of energetic escapism that fell on an eager crowd, keen to see the band bring across the rich, at points slightly country, production of their debut album with an electric elegance.